Today brings a simple but sweet Friday Find, courtesy of beautiful 1950s packaging. 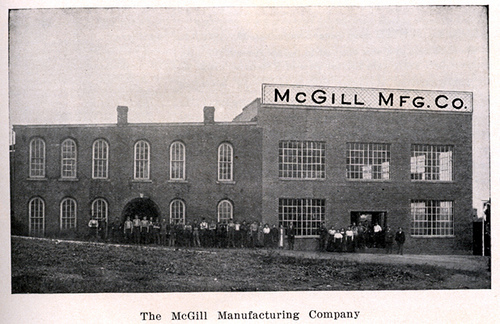 The McGill Manufacturing Company was established in 1910 by James McGill, a man of entrepreneurial spirit with a wide breadth of interests. 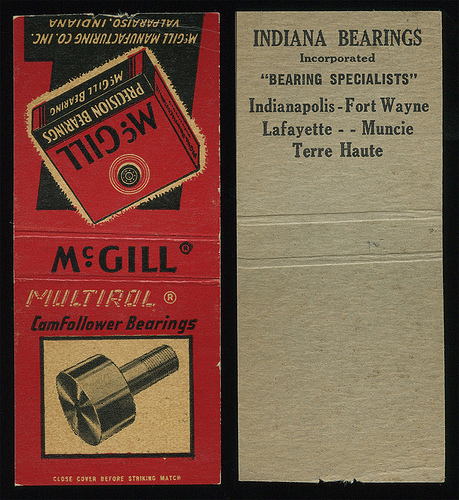 Before becoming a nationwide specialist in bearings, McGill dabbled in venetian blinds, golf clubs, gold mining, laxatives, washing machines, gyroscopes, and cracker jack whistles. 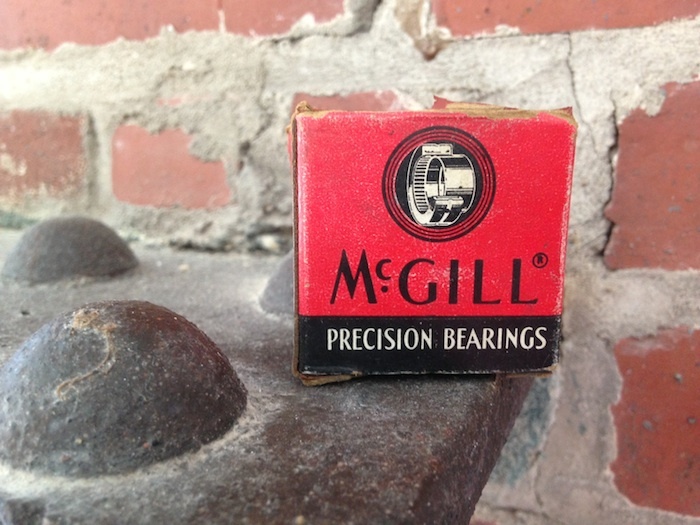 The small ball-bearing box we found in one of our houses showcases the simple and elegant design of McGill’s mid-century packaging, as does the matchbook below. The company still exists, sort of, though they’re a subsidiary of a division of a multinational. 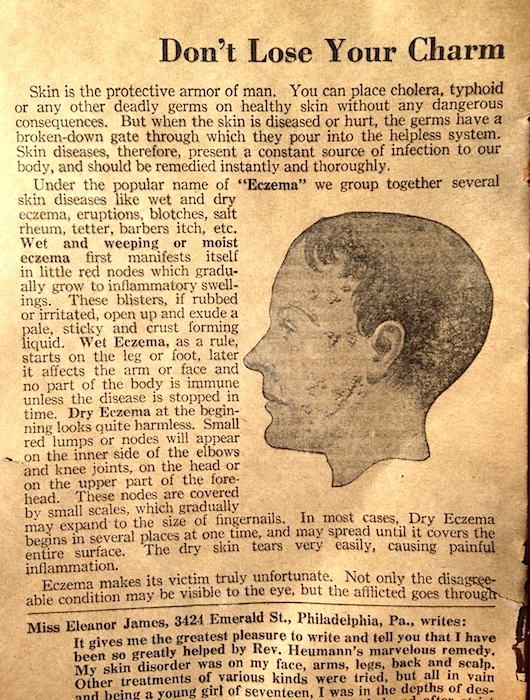 There’s also a page about eczema, titled “Don’t Lose Your Charm” with a photo of a young lad whose pocked face indicates that he has clearly lost his charm. On the last page, Rev. 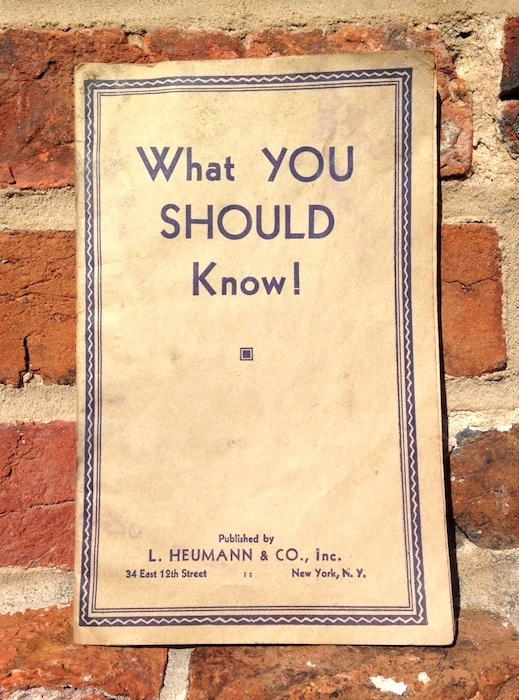 Heumann claimed that he’d received over 7,000,000 requests for pamphlets- if this claim is to be believed (read: this claim should NOT be believed), one out of every 17 people in the United States requested one of his pamphlets. It seems as though we’ve dug ourselves into quite the hole: last week, we found the find of all finds (especially if you’re as nutty about bricks as we are). How can we top this gem? 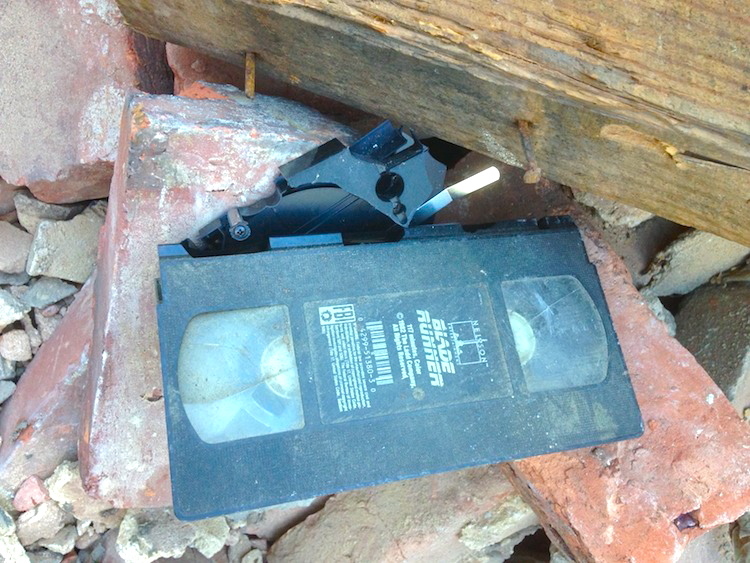 It’s called a Video Home System cassette- apparently, there was a time when you couldn’t watch any movie in the universe by tapping into an amorphous system of interconnected computer networks. You had to actually go to a “movie store” and “rent” a “VHS tape” which you would then have to physically stick into a Videocassette recorder. 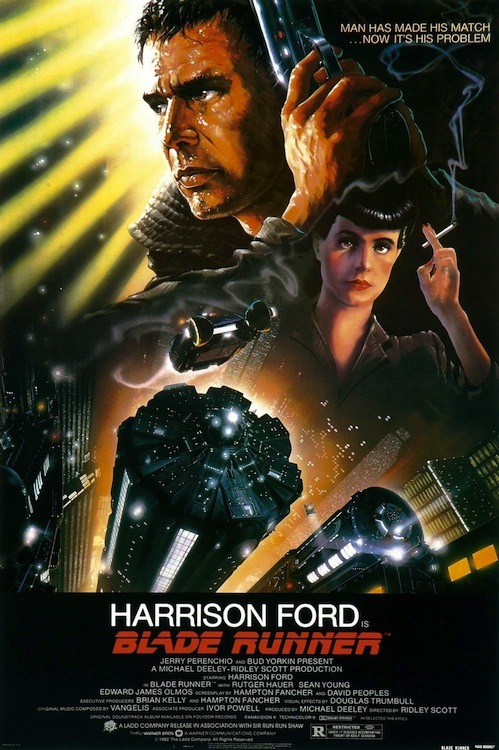 This particular cassette contained the 1982 movie Blade Runner, which looked ahead to the dystopian year 2019, when genetically engineered “replicants”, ordinarily relegated to menial work in space, were sneaking around Earth and being chased by Blade Runners. How prophetic! This is the Friday Find to end all Friday Finds. 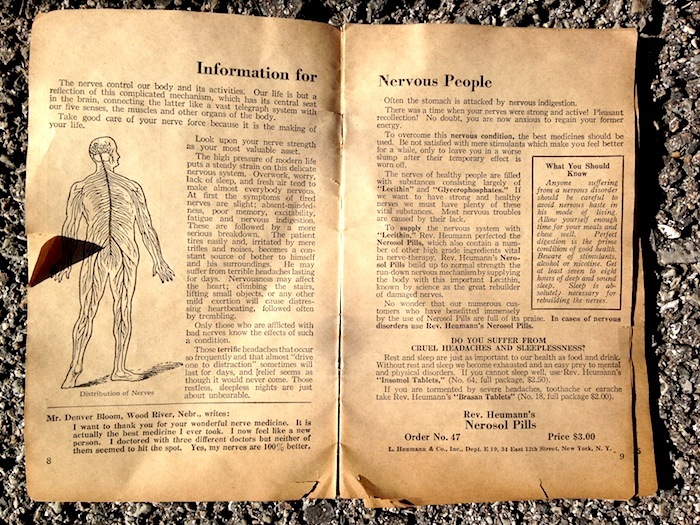 The title of this post is a misnomer: “needle in a haystack” is generally used to describe the near futility of finding a sought after item hidden among a mess of other non-sought after stuff. A more apt description of today’s Friday Find would be a needle in a galaxy of haystacks, and it comes to us via the incredibly sharp eye of Ms. Bernadette. We clean a lot of bricks on Eager Street. In fact, we’ve palletized north of 100,000 of them so far. 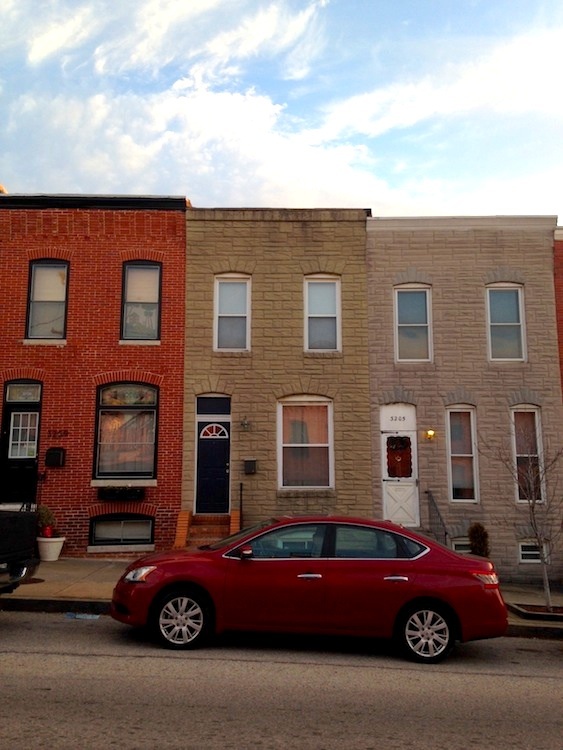 All told, the 35 houses on the 2400 block of Eager Street contain well over half a million bricks. If you lined up half a million bricks end to end, you’d have a row that would stretch from Baltimore to Wilmington, DE. In a sea of anonymous bricks, what are the chances that Bernadette would spot the jewel below? If you can’t quite make out the writing on the brick above, you’re looking at the handiwork of one James Walker, who scrawled his name, the date (June 21st, 1906 A.D.) and his hometown (Highlandtown, MD) on the bed of the brick. 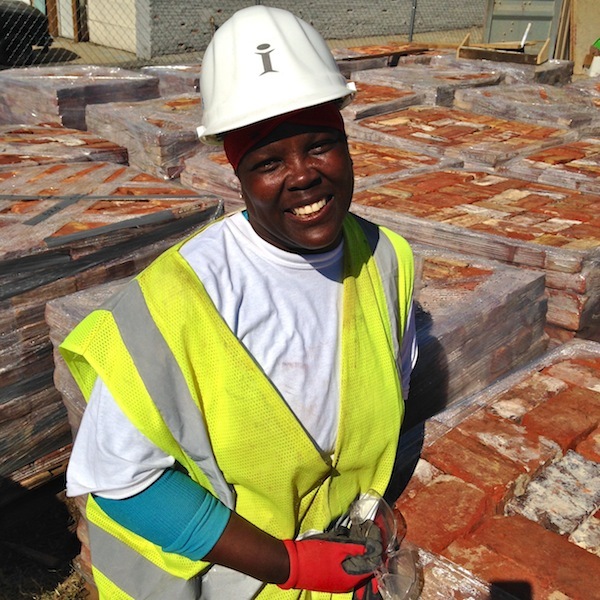 Bernadette tells me she was stacking bricks when this brick caught her eye for some reason. The odds of her finding this among the half million others are beyond miniscule. James A. Walker was born in Indiana in 1872 to Irish parents. He moved to the Baltimore area shortly thereafter, where he took up work as a bricklayer. 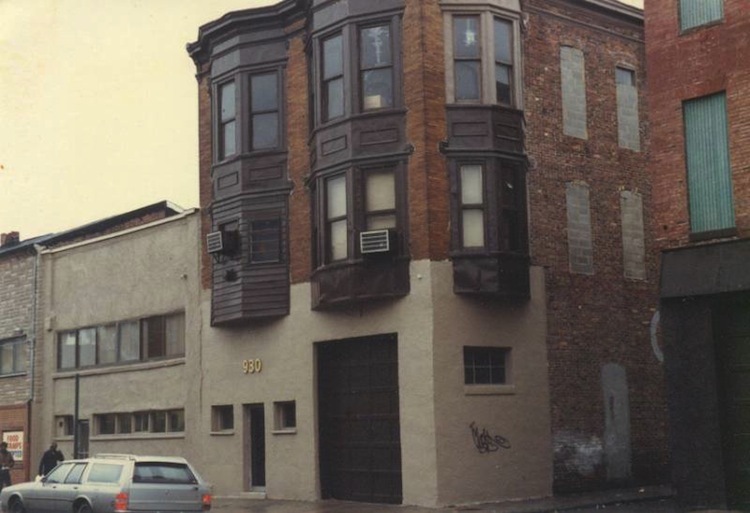 By 1910, he lived at 3207 Canton Ave (now Fleet Street) with his wife, Mary, and his three children. Elmer, his 15 year-old son, worked as a pipefitter’s apprentice, and his 13 year-old daughter, Gertrude, worked as a helper at a can factory. 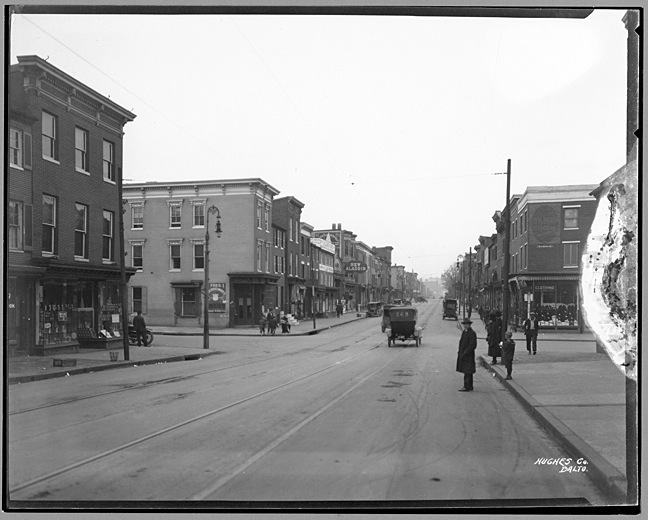 By the time the 1920 census was taken, Highlandtown had become incorporated into Baltimore (just one year earlier) and James had moved on from brick setting to carpentry, an occupation he would keep until his retirement two decades later. It’s tempting to say that James’ message is analogous to a modern “James Wuz Here” tag, but James likely never meant for anyone to see this brick. He would have scratched his words into the brick before it was fired, probably just after it was molded, the clay still wet. The wet clay then would have been sent to the kiln, where James’ words became baked into the brick itself, achieving a longevity uncommon for what was likely no more than an act of boredom. The fired brick then would have been sent off to be laid in a nearby house; maybe the bricklayer saw James’ message, maybe not. Regardless, with a quick flick of the bricklayer’s wrist, a smear of mortar should have covered the words for all time. 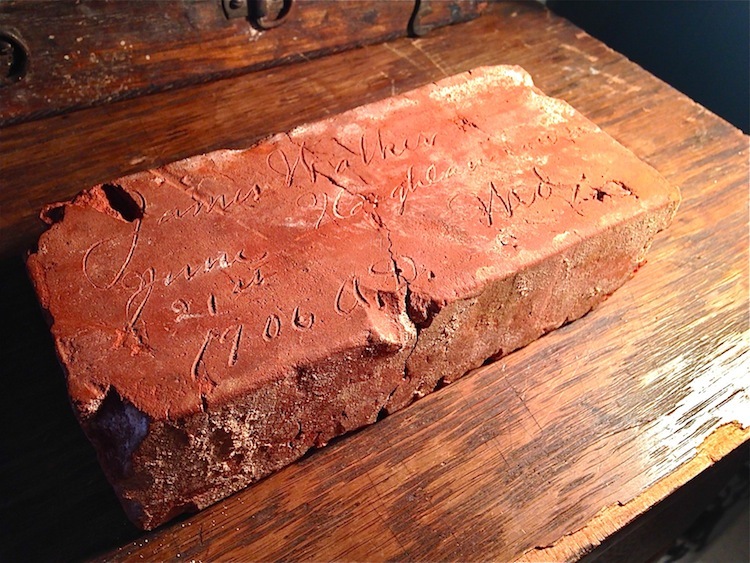 Did James Walker, the brick setter, imagine the lives of the bricks he molded? Did he assume that the bricks he made, durable as any contemporary building material, would serve stoically in Baltimore rowhouses for centuries? Or maybe he was a realist, and imagined that one day his bricks would be pulverized by a wrecking ball or steam shovel. 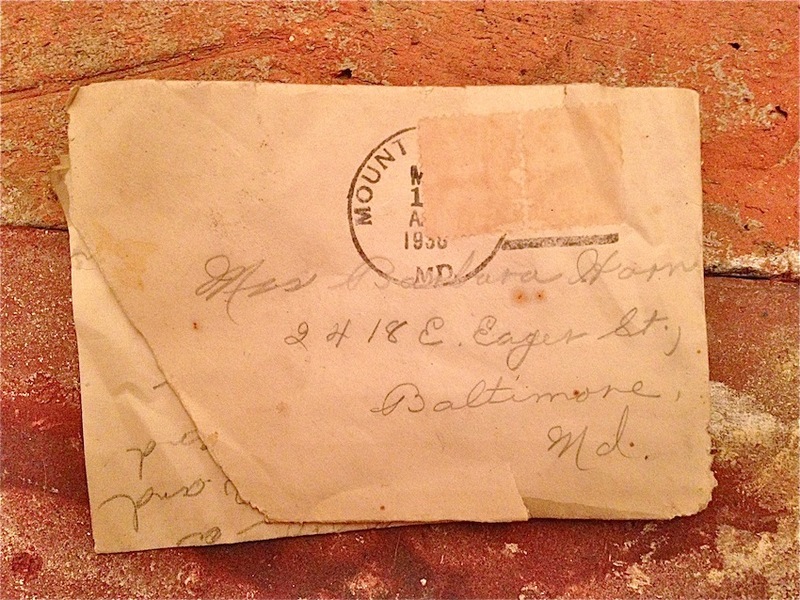 One thing is for certain: James surely did not envision that 109 years after he scratched his message, a crew of fellow Baltimoreans would be taking apart a block of rowhouses, brick by brick, and come across his scrawl. 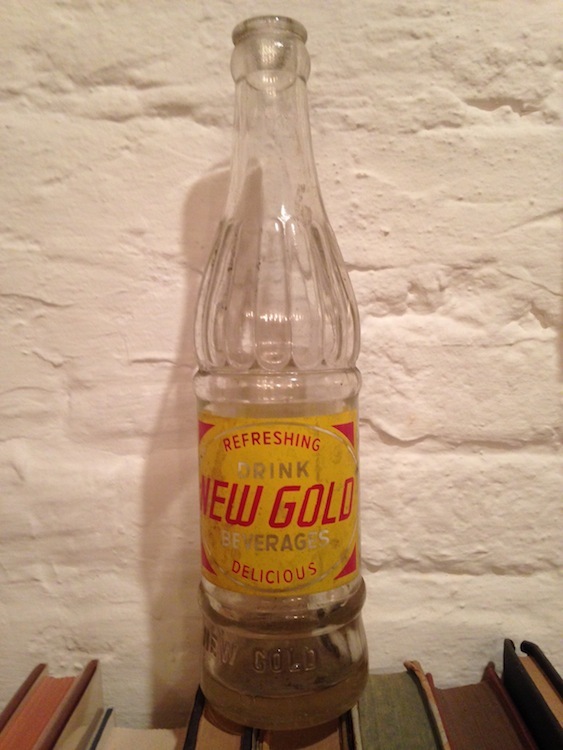 Another bottle for ya on this edition of Friday Finds, this time a late 1940s to early 1950s “New Gold” soda bottle we found in a pantry in one of our houses. 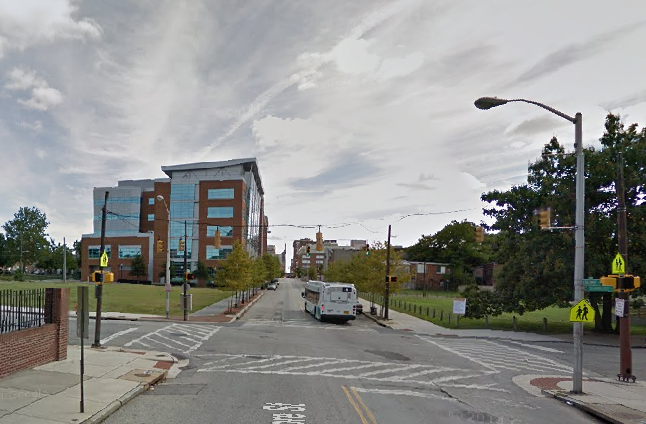 The story behind this product takes us across town into West Baltimore. The New Gold Bottling Co. was founded in 1925 by Dionicios Karavedas. Dionicios (who would later Anglicize his name to “Daniel”) worked as a shoe shiner before getting into the world of soft drinks. In 1942, New Gold moved into new digs at 930 W Baltimore Street, taking over a space formerly occupied by a succession of movie theaters. The company produced the popular “Sun Spot” soda along with the house brand “New Gold” bottle we found. Following the 1968 riots, the company experienced a sharp decline in sales, and Nicholas Karavedas, who had taken over from his father, explored a new and ironic line of products, namely a beverage that would detect sugar when ingested- Nicholas eventually refined his drink into a glucose-testing product useful for the detection of diabetes. Another twofer in this edition of Friday Finds: old vinyl records. 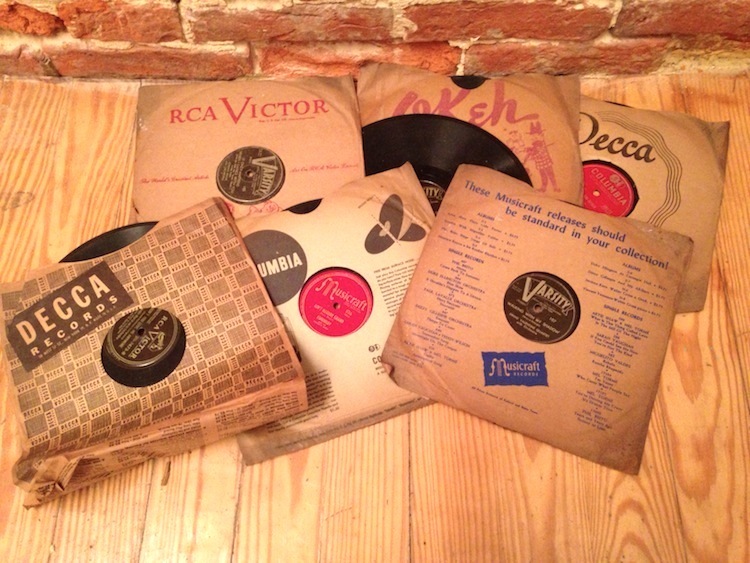 The first batch of records dates from the late 1940s. In this stack we actually have some rarities, or at least some deep cuts by folks who never quite made it big. There’s “Ain’t Nature Grand” by little known country songstress Esmereldy. Then there’s “Walking With My Shadow” by the Jimmie Valentine Quartet and “Boulevard of Memories” by jazz clarinetist/saxophonist/band leader Woody Herman. None of these songs made the Billboard Top 40, so it’s possible that an Eager Street denizen in the 1940s was a hipster who listened to bands nobody had ever heard of. If Ronald Isley’s outfit didn’t already give it away, these albums come straight from the 1980s. Midnight Love was Marvin Gaye’s last album before his untimely death at age 44. It featured what would become the biggest hit of his career, “Sexual Healing”. 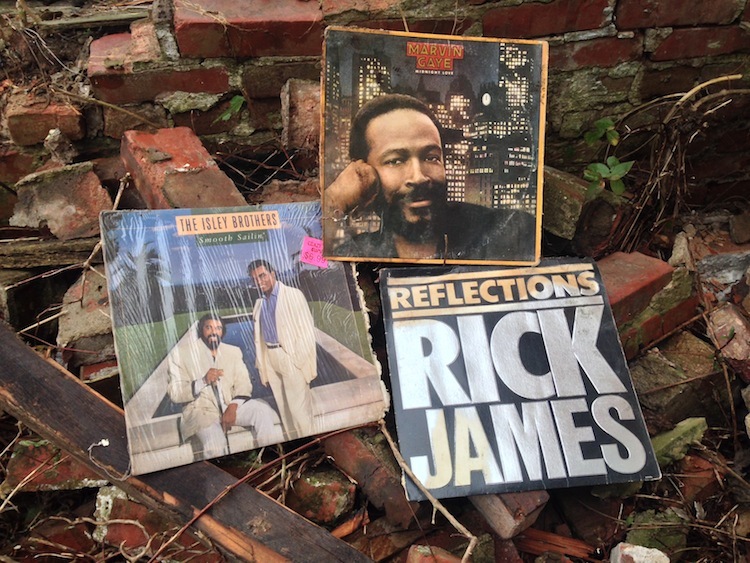 Reflections was Rick James’ first compilation album, featuring an extraordinarily clever reflecting (get it?!) record jacket. In 1930, Jacob Horn, a cement finisher, lived with his wife Barbara and their daughter, also Barbara, at 2418 Eager Street. With them lived Ferdinand and Helen, listed as Jacob’s stepson and stepdaughter, respectively. I received your letter and glad everyone is OK. I am feeling better. I would like a bottle of ink and a washrag. And send me a pair of pajamas, the pants don’t have to match. I need them please. Don’t send any thing I have plenty here. I am glad Pop got home safe. Well don’t forget those things I need please. 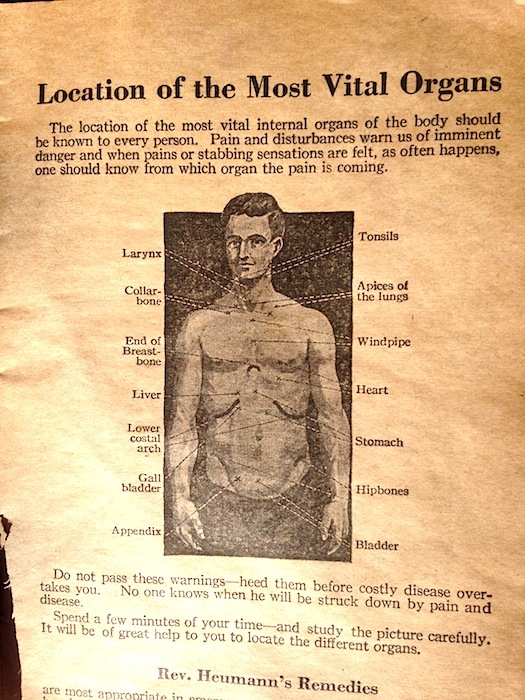 Take care of yourself and be careful. This next part is tricky and involves a healthy measure of speculation: the Helen living at 2418 Eager Street in the 1930 census had a listed last name of Dorn. Remember, she’s listed as Jacob’s stepdaughter, meaning that she’s likely Barbara’s daughter from a previous marriage. In the 1940 census, the Horns still lived at 2418 Eager, and they now welcomed granddaughter Margaret Seifert to their home. Margaret’s parents were not listed as living on Eager, so it’s hard to tell who they might have been from the census records and it’s not clear where the name Seifert came from. 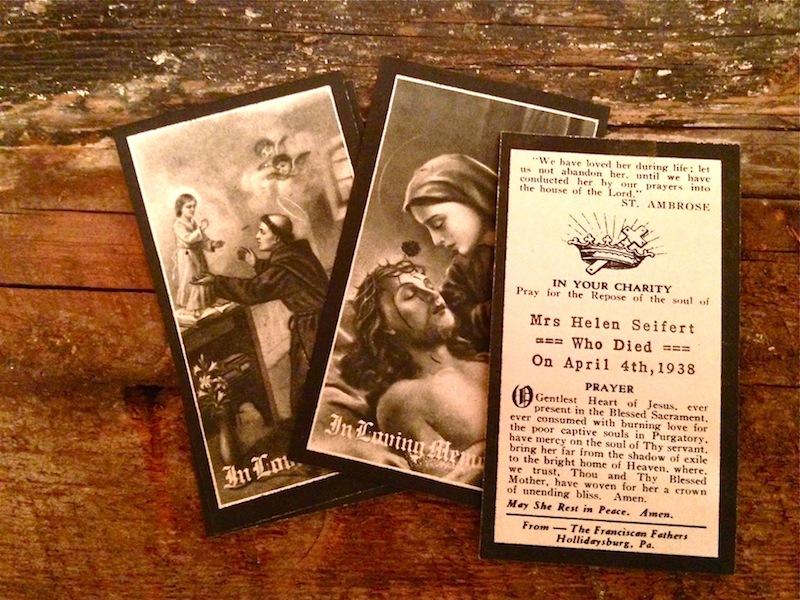 Alongside the letter, in a box in the basement of 2418, we did find a clue: a stack of Mourning Pictures commemorating the death of Mrs. Helen Seifert, who died on April 4th, 1938. It seems possible, maybe even likely, that these Mourning Pictures refer to Barbara Horn’s daughter Helen, who in the 8 years since the 1930 census had probably married a man named Seifert and had a child. 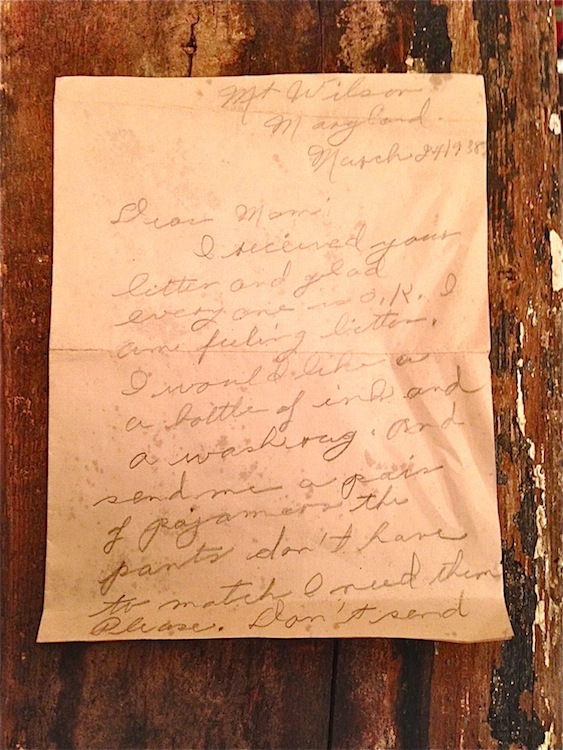 If this is the case, Helen’s letter to her mother, dated March 28th, 1938 would have arrived at 2418 Eager Street just days before Helen passed away on April 4th at the age of 22. 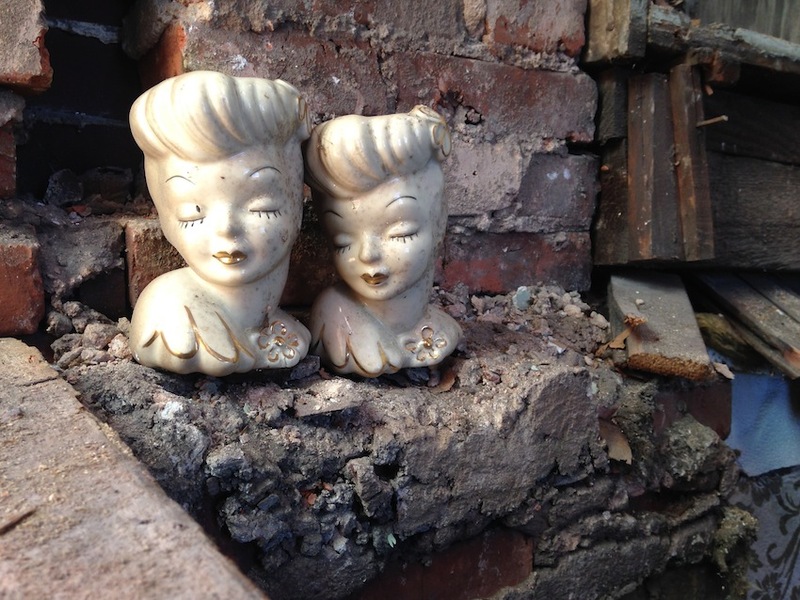 This good looking pair comes from the basement of 2418 Eager Street. You can’t see from the photo above, but there are holes in the top of the ladies’ heads: these are “Glamour Girl” vases, part of a broader group of collectibles known as Lady Head Vases. The name says it all- they are vases shaped like ladies’ heads. 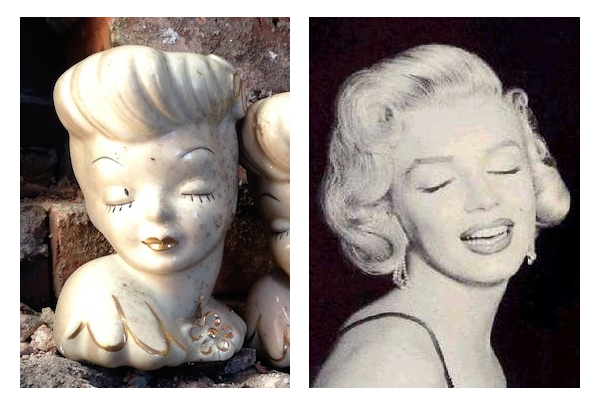 The ones pictured above were made in the late 1940s, around the same time that a young Marilyn Monroe (Norma Jeane Mortenson at the time) was breaking through. Maybe I’m imagining it, but I certainly see a resemblance. Vases like these were originally produced by florist companies as something of a gimmick, but also as a clever (or cheap) sales strategy: the openings in the vases were quite small, thus limiting the amount of stems needed to fill the vase. Eventually, well-respected ceramicists started producing their own Lady Head Vases and a collectible was born. These vases are ceramic, so it’s no small feat that they’ve survived at a job site where tons of material (literally, tons of material) is constantly moving past them. The houses on Eager Street are full of relics from eras past- alongside the old newspapers, bottles and personal items that we’ve highlighted before, it’s also important to examine the building materials that come together to form a home. It’d be easy for a few sets of hinges to get lost amid the thousands of bricks, joists, and floorboards that we’re salvaging, but it was impossible to overlook these ornate beauts. This hinge is almost certainly original- despite several coats of paint, one can still make out intricate designs along the wings. Small pieces like this hint at a level of quality and craftsmanship in home construction and finishing that seems threatened with extinction. To be sure, we’re not suggesting that these hinges were tapped out by a artisanal blacksmith- they were likely mass-produced in a local or regional factory. 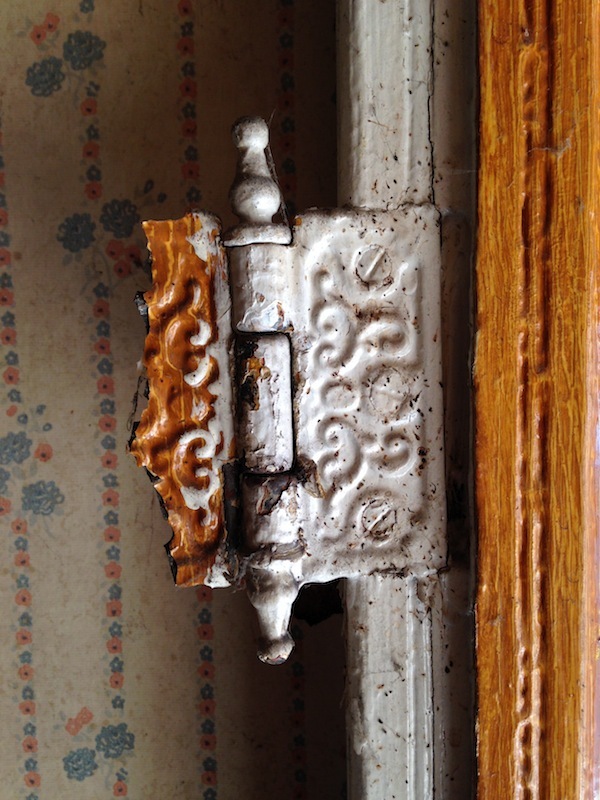 But it’s clear that when these hinges were made around 1906-1907, aesthetic value and attention to detail had not yet been crowded out by the relentless drive towards maximum efficiency and profit. For 11 months out of the year, basements are the places for Christmas decorations, and the houses on the 2400 block of Eager Street are no exception. In #2418, we found the “New Brite Lite Multiple Candelabra 15 Candle Outfit” pictured above. Judging by the wiring and the packaging, it dates from the 1950s. 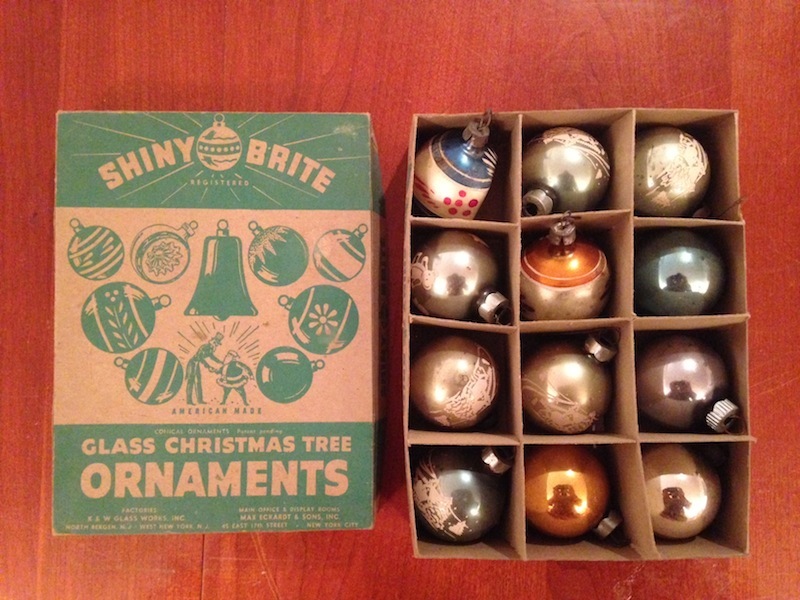 We also found a set of “Shiny Brite Glass Christmas Tree Ornaments”. It appears as though clever misspelling was a cool thing to do during the 1950s. Shiny Brite was the brainchild of Max Eckardt who had been in the ornament business since 1907. Eckardt’s business largely relied on importing ornaments from Germany, but the Second World War forced him to change his strategy: he convinced the Corning Glass Company to adapt their light bulb manufacturing process to enable the mass production of ornaments. From the Corning plants, the ornaments were shipped to Eckardt’s factories where they were hand painted. 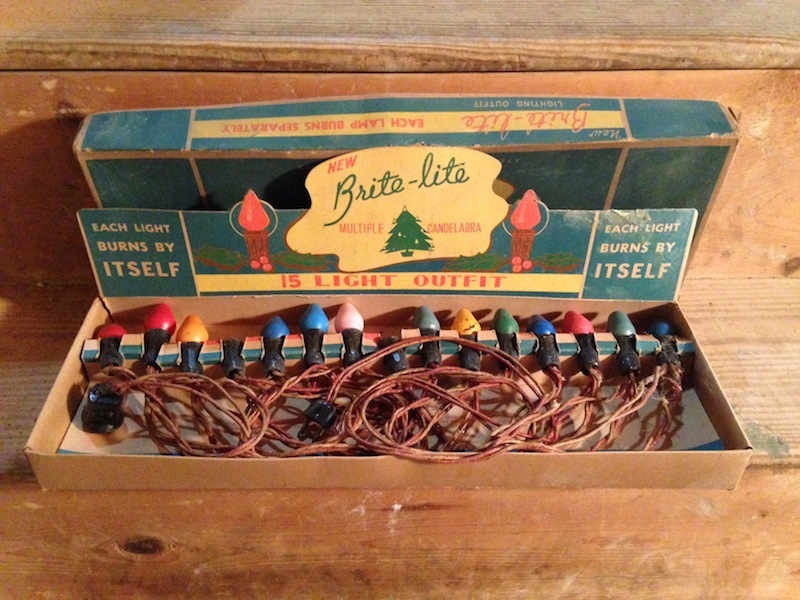 During the war, Shiny Brite was keen on emphasizing the American (as opposed to German) provenance of their wares. 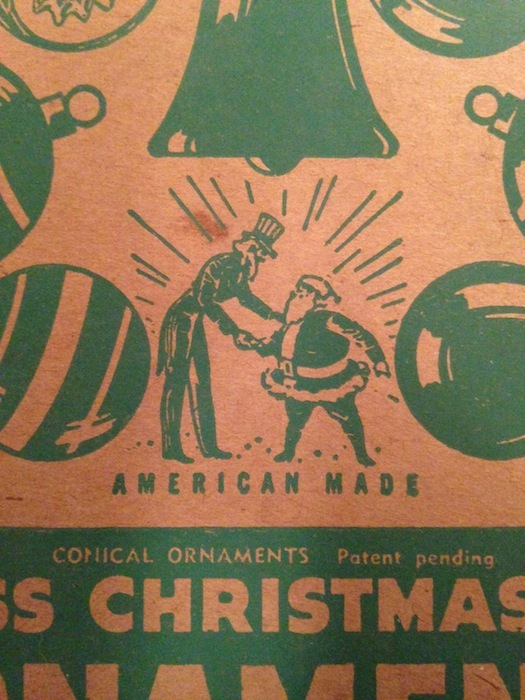 Front and center on the box is ‘AMERICAN MADE’ in bold text and an illustration of Uncle Sam shaking hands with Santa Claus.